When a child who is born with Down syndrome to a family in the Calgary area, you may be the recipient of two beautiful gifts…. the first gift is the most important.. your wonderful newborn child that will fill your hearts with a LOVE that you could never imagine experiencing…….. second is a gift basket filled with goodies for your newborn along with resources for your family to access once at home with your bundle of joy…… these wonderful baskets are given to families in the Calgary area and could not happen without generous donations from people in the community, friends and family members of Adele’s Over the Rainbow Baskets. 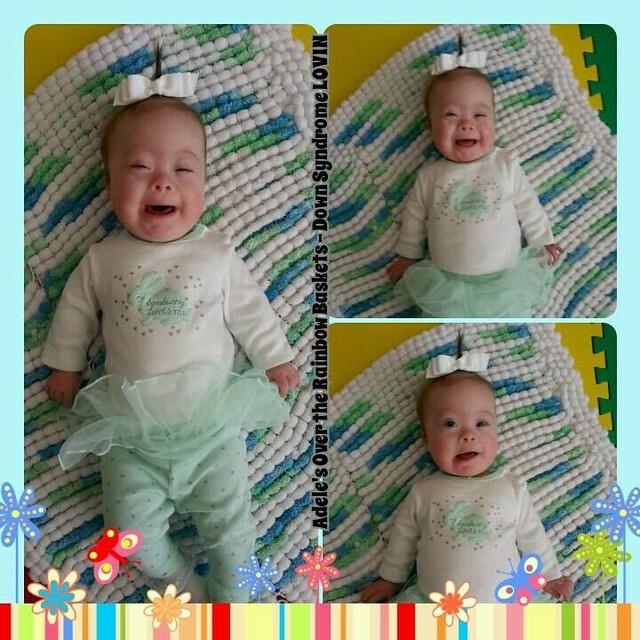 Krista Rowland-Collins was inspired to create beautiful baskets after she had given birth to her bundle of joy Adele, born with Down syndrome last year. Krista wanted to make baskets for new families to provide hope and comfort and joy. Krista said “I want the family to go home and not feel so overwhelmed at what needs to be done, but instead go home and enjoy their little miracle”. The baskets are local to the Calgary area but Krista has had other families contact her to see how they can start up a basket giving program in their area for families. The response has been fantastic!. Krista has received donations from all around the world to help fill her baskets with goodies. In the baskets are some of the following items; bibs, books, sleepers, diapers, blankets, hats, burp cloths, gift certificates for diaper delivery service, lotions, shampoos, mittens, hair accessories, rattles, stuffed animals and much more. To find out more about Adele’s Over The Rainbow Baskets and more, please check out the face book page or Krista’s blog A Perfect Extra Chromosome . There are many wonderful stories being shared on this page as well. Thank you Krista for sharing your beautiful heart with all of us. This entry was posted in other, Friends, Cool Cool Sites we follow. Bookmark the permalink.